Michael Zytkow is in gaming hell...or gaming paradise, depending on how you look at it. It's Father's Day and his wife and kids are at a cookout somewhere in Charlotte without him. 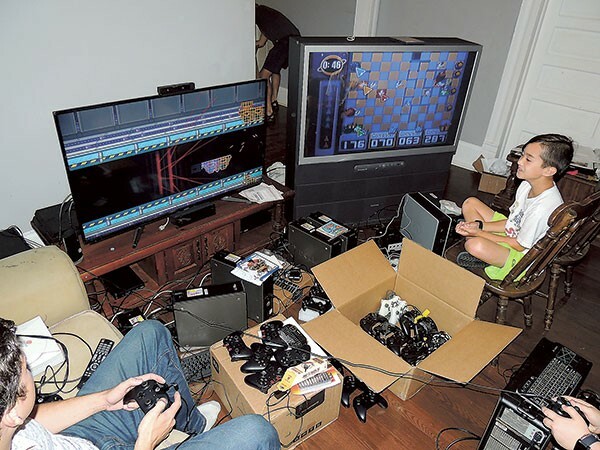 Instead, he's standing in the living room of his newly purchased NoDa home wading through a sea of electronics; thousands of dollars worth of PCs, modems and game consoles (old and new), along with the more than 60 controllers that go with them. He's testing all of it, as he's been doing for months while acquiring each piece of equipment one by one, sometimes through shady parking lot deals set up over the internet. "I feel like when you pull off something like what we've been planning and there's all this relief and celebration, that's when you look back at all these times when it got crazy and you can laugh," Zytkow says. "But right now I feel like I'm in it." What he's in is the final planning stages for the first Potions & Pixels event, a gaming night at Petra's in Plaza Midwood planned for June 23. Zytkow will set up about 20 TV and computer screens throughout the bar to stream indie PC video games or hook up gaming consoles that vary from Super Nintendo to Sega Dreamcast to PlayStation 4. He will also bring around 50 board games from the massive collection of more than 300 that he keeps stored in his house. For Zytkow, who has long been known for his activist work in Charlotte — he was one of the faces of Occupy Charlotte, ran for city council in 2013 and currently works with Greenpeace — this is the real passion project. "This is my life. It's kind of funny because a lot of activists are shocked about it, because I kind of separate the lives a little bit," Zytkow says. "I always wanted to be a game designer and then I switched because I decided, 'Oh, I have to go change the world.' I still want to go back to games and this is sort of a way back to something that's just pure and fun. Activism sometimes has that moral grey to it, this is just unadulterated fun that anybody can get into." 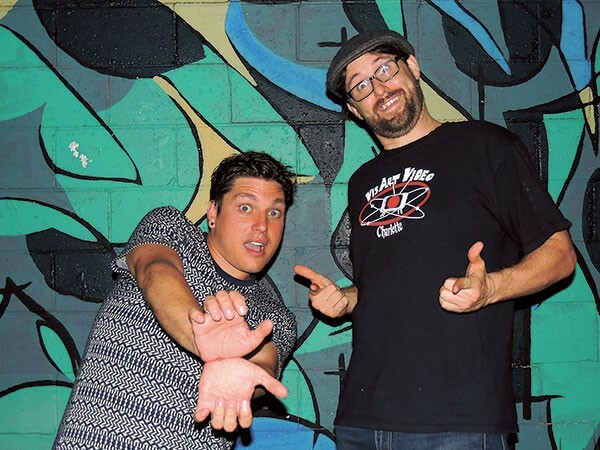 Michael Zytkow (left) and Jason Haynes hanging out at Petra’s, where they’ll launch the first Potion & Pixels event on June 23. Potions & Pixels is the brainchild of Zytkow, who just turned 30, and longtime friend Jason Haynes, 33. The two began planning to open a game lounge and coffee shop under the same name about a year ago. The event at Petra's will be a way to troubleshoot some of the technical aspects before committing to a brick-and-mortar location. "This lets us test it out without all that upfront capital and upfront risk," Zytkow says. "We're going to be walking around, helping folks out, seeing what games are popular, what kinks we need to work out, then we're going to reform it." Zytkow and Haynes plan to continue holding Potions & Pixels on the second Thursday of each month at Petra's and hope to add more locations as things progress. The café and gaming lounge is still in the plans for the future, but they're in no rush. "It's still definitely on my mind in the long term, but I think it's going to be a while before we really develop that out into a permanent site," Haynes says. Haynes grew up playing video games but had let it slip away until Zytkow, a close friend of Haynes' current girlfriend, reintroduced him to the gaming culture. "It's funny because I had actually fallen out of video games and board games for a while until I started hanging out with Mike," Haynes says. "A lot of my best memories growing up involve going over to a friend's house or meeting up with a big group of people and playing old games. As I transitioned into adulthood, I had fallen out of the scene a bit. Mike has kind of pulled me back in and reminded me how cool it is to get together with big groups of people playing games together. You can meet a lot of people and have a lot of great experiences." Zytkow (far left corner) enrolled the help of friends and friends’ kids to help him test the many titles he plans to roll out for Potions & Pixels. That, in the end, is the goal for Potions & Pixels. Zytkow recently took a trip with Greenpeace around the country, and while he was in each city he visited events similar to the one he'll be hosting soon in Charlotte. The plan was already in motion at the time, but Zytkow was further motivated by the ease with which he was making friends in these cities where he didn't know anyone. One experience that stuck with him was in San Francisco, California, where a weekly event similar to Potions & Pixels called ShowDown averages a turnout of between 500 and 600 people. "To me that was like, 'Damn we have got to do this,'" he says. "It was a feeling where you sit down, you've never met these people before, but you have this connection. Suddenly we're laughing and joking with each other and I'm meeting a guy from Russia who does the special effects for Taylor Swift's music videos and we're wrapped up in an interesting conversation. That's a true story." Not far from Zytkow's new home is Abari, a recently opened bar and arcade that's the first of its kind in Charlotte. It allows people to experience the above-mentioned connection through games on a nightly basis. Abari opened on North Davidson Street in March and has been a hit with both longtime gamers and newcomers since. The arcade bar offers players about 40 retro arcade titles, 10 pinball machines and old game consoles like Sega Genesis set up in a living room-type lounge area. Owner Zach Pulliam has watched experiences like those mentioned by Zytkow and Haynes happen in Abari since it opened, and it's affirmed his love for the gaming industry. One specific game, the biggest draw in Abari, has brought people together more than others. "Killer Queen" is an arcade game that hosts up to 10 players at a time, and it's a hidden gem here in Charlotte — one of only 12 machines in the world. "It's really nice to see these people connecting over gaming," Pulliam says. "'Killer Queen' is one of those things where so many new people have met and formed friendships from playing that game and it's awesome. We have guys that come in every Monday to play that game that had never met before they played that game and now they're like best buds. To me that's incredible." Zach Pulliam in Abari, a bar and arcade he opened in March. The game was developed by independent game designers Joshua DeBonis and Nikita Mikros and released in 2013. It involves two teams, each led by a powerful queen, trying to be the first to return a snail god to its home, fill its hive with nectar or pull off a triple assassination of the other team's queen. Like many independent games, the graphics in "Killer Queen" don't look like what you might expect from a game released in recent years. While franchise games with big budgets like "Uncharted" and "Madden" continue to improve on their pristine graphics and virtual reality games begin to enter the industry, a large group of gamers are heading in the opposite direction. These gamers prefer to collect and play retro games they grew up with or develop simple, independent games that more resemble retro platform games than anything created with a big budget and large staff. 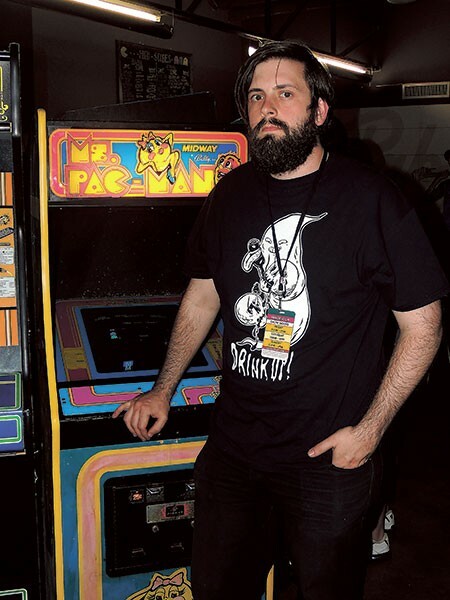 Wilder Hamm opened Save Point Video Games in the University area in 2012. The store focuses on retro games and collectibles, and has hosted a tournament of one type or another every week since its opening. Hamm says he's seen prices on popular old titles double, triple and in some cases quadruple just in the four years he's been running Save Point. He credits that with the fact that many people who grew up playing video games in their homes are now reaching an age at which they're financially stable and gaming carries a certain nostalgia for them. Hamm, who donated the consoles at Abari, says he believes the nostalgia factor is also why you see gaming playing a bigger role in adult hangout spots like Abari or Hattie's Tap & Tavern, where board games and a Nintendo 64 are always available for patrons. "A lot of people who grew up playing that stuff are now at the age where they have comfortable lifestyles; a wallet that they may be able to afford their old collection with," Hamm says. "People who like to go out to bars in their free time, if they can hang out and play video games at the same time, people really enjoy that." It's not all pixelated, retro games that make up Charlotte's gaming culture, however. Reports surfaced in May that Team EnvyUs, one of the most successful eSports organizations in the world — known for their success in modern games like "Call of Duty," "Gears of War" and "Halo" — is working with Charlotte-based venture capital fund SierraMaya360 to build a headquarters for the team in Charlotte. The property would include a studio, offices, a LAN center, a training facility and an arena that will play host to large eSports tournaments and technology camps. "I think [the arrival of Team EnvyUs] is showing you how gaming is going," Pulliam says. "Even ESPN2 is playing eSports. It's so much more acceptable. They're building this compound with a theater to watch people play the games, it's going to be insane. I think something like that — and then Potions & Pixels — really will start opening the doors for bigger events in Charlotte." Perhaps the biggest boon to the gaming industry hasn't been that gamers are growing up and making more money, but that "gamers" as a term now includes just about anyone. "I don't think it's just Charlotte, it's the world in general," Pulliam says. "The video game industry is a giant right now. The reason behind that is games are more accessible, basically everyone is a gamer. Even your grandma I bet played 'Farmville' or something like that. It's no longer 'geek.' It's more acceptable to love video games than it was maybe in the '80s. It's something that's kind of become just part of everyday culture." Hoping to cater to beginners and experts alike, Zytkow and Haynes have spent months curating the list of games they'll feature on Thursday. All but one game will be multiplayer and can quickly be learned by players at any skill level. On Thursday, they'll see if it's been worth the months they've spent braving shady internet deals, staring at screens and testing equipment. "I just hope a lot of people will show up, and people will engage with one another," Haynes says. "I'd like to see little pockets of two to three people come out and they meet two to three people and then they go play games together. Then we have events where these same people come out and it's like, 'Hey, I remember you from the last time' and you are kind of putting the whole social circle together." If one thing is for sure, Charlotte is ready for it. Now, pass the sticks.